The English Department officially established a concentration in creative writing in 1992. Staffed by Robert Farnsworth, Steven Dillon, Eden Osucha, Robert Strong, visiting novelist and Bates alum Jessica Anthony, and Lillian Nayder, the concentration has begun the training of numbers of young writers who have since published widely. 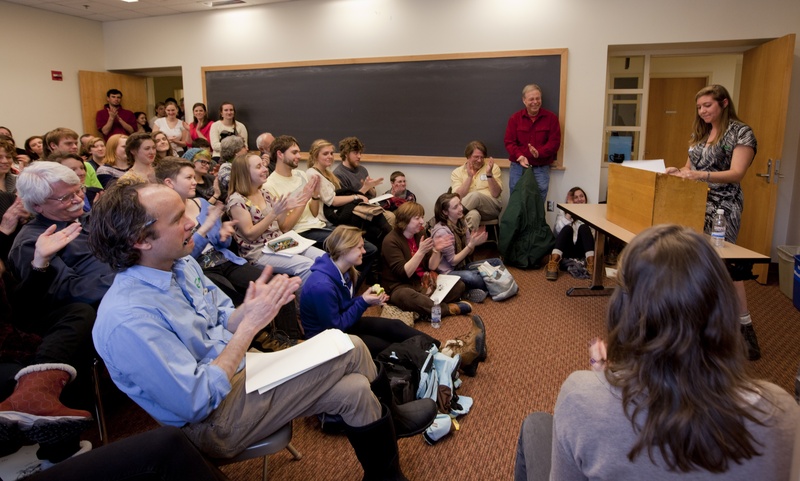 As the concentration took shape, the department’s reading series, now called Language Arts Live, began regularly inviting a wide variety of writers to Bates to read from their work, and sometimes visit classes and confer with students. Three allied courses, often from among those taken to satisfy the major, in the English Department or in the literature of a foreign language, which will be useful to the student’s develop­ment as a writer, chosen in consultation with his/her advisor. For example, a fiction-writing student might take American Fiction, the English Novel, and The Latin American Short Story; a poetry-writing student might take Poetry in the 21st C., John Donne & T.S. Eliot In Our Time, and The Lyric Answers. A thesis (either one, or by approval, two-semester) consisting of a coherent collection of the student’s fiction or poetry. Majors who elect the creative writing program count one of the writing courses toward fulfillment of the English major requirements, as well as the allied literature courses, and thesis. Thus, the minimum number of courses required for the English major and the creative writing program is 13. 1) Have successfully completed the 3 courses in writing required by the program. Students who have not yet done this, for reasons of off­-campus study, e.g., may undertake creative theses provided they take the remaining required writing course(s) by the end of senior year. The department will consider the substitution of a full-term, or intensive summer course taken elsewhere for one of the three required workshops, but requests for such substitutions must be made in writing to the chair, and include a syllabus and portfolio. 2) Secure an advisor for the project by the tenth week of winter term, junior year. At this time the student will decide whether to submit a proposal and sample pages to the department, requesting the opportunity to write a two-semester thesis. Student and advisor will also begin devising a working schedule for the project, a reading list, and a plan to ensure that the student habitually writes, rewrites, and plans during the summer before senior year. The plans that advisor and student make during the spring of junior year will be based on a consideration of the student’s work to date, as well as his/her initial ambitions, and will stipulate the duration of the thesis. We expect many creative theses will be completed in one semester, but STUDENTS WISHING TO EMBARK UPON A TWO-SEMESTER PROJECT MUST SUBMIT A PROPOSAL AND AN 8-12 PAGE SAMPLE OF THEIR WRITING IN THE PROPOSED GENRE FOR DEPARTMENT APPROVAL BY THE FIRST WEEK OF SHORT TERM OF THEIR JUNIOR YEAR. If the request is approved, the student shall proceed with the understanding (as with English Dept. honors projects) that the advisor’s assessment of the work produced during the fall term, and the student’s adherence to deadlines will determine if a two-semester project goes forward beyond the end of Fall term. The creative writing committee, composed of those faculty engaged in teaching workshop courses that year, may decide that a thesis should be completed by the end of the Fall term, or it may grant an advisor and student request to extend a thesis into a two-semester project. 1) Fall term: Register for English 457, participate in workshop 391 or 392 if necessary or desired; complete thesis by the end of Fall term. 2) Fall term: register for 391 or 392. Winter term: register for 458, write thesis. 3) Work independently with advisor through senior year, registering for 457, then 458. ONE SEMESTER POETRY: At least 15, but not much more than 20 poems. A ca.10 page preface discussing craft, influences, intentions. ONE SEMESTER FICTION: At least 45, but not much more than 70 pages of fiction. A ca. 10 page preface discussing craft, influences, intentions. TWO SEMESTER POETRY: At least 25, but not much more than 30 poems. A ca.10 page preface discussing craft, influences, intentions. A public presentation (reading) from the work, to be delivered in Short Term of senior year, optional but strongly encouraged. TWO SEMESTER FICTION: At least 65, but not much more than 100 pages of fiction (stories or novella, e.g.) A ca.10 page preface discussing craft, influences, intentions. A public presentation (reading) from the work, to be delivered in Short Term of senior year, optional but strongly encouraged. TWO-SEMESTER creative theses will be read for approval and comment by the advisor and another member of the Bates faculty, not necessarily a member of the English Department. Thesis authors are responsible for securing agreement with their second readers. Responsibility for assignment of a final grade rests with the advisor. At a mutually convenient time, often during Short Term, student, advisor and second reader will meet to share responses to the thesis, and discuss the work in further detail.